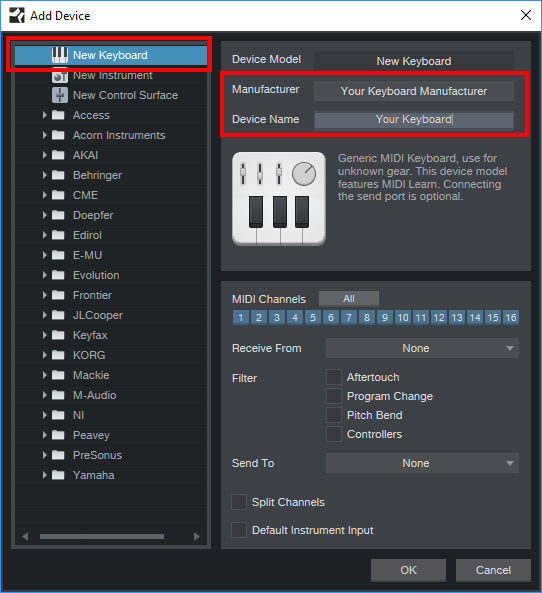 Studio One 4 - How Do I Setup a MIDI Hardware Keyboard/Synthesizer in Studio One 4? In Studio One 4, an External Instrument is an external MIDI hardware synthesizer, workstation, or other device that can generate or manipulate sound. External Instruments are set up globally and then are available for use in any Song. Make sure your external devices are connected to your computer either by MIDI cable or with a USB connection. Please consult the devices documentation for instructions on how to connect that device to a computer. One thing to note, a MIDI connection alone will not allow the monitoring of audio from the external device. Please make sure your audio interface is setup for Studio One in Studio One > Options/Preferences(OS X) Audio Setup. The external MIDI devices audio outputs are connected to the interface, and routed into Studio One either by hardware monitor, or via an Audio Track. In the External Devices menu, click on the Add button. In the left hand browser select New Instrument. Type in a Manufacturer Name and a Device Name in the appropriate fields. This will make using your New Instrument easier. Specify which MIDI channels will be used to communicate with this Instrument. MIDI channel 1 is selected by default. Select the appropriate MIDI device from the drop-down menu for Receive From and (optionally) Send To. You can choose to send MIDI Clock to this Instrument and/or use MIDI Clock Start by checking the appropriate boxes. You should send MIDI Clock to your Instrument if it has a built-in sequencer or components (such as LFOs) that need to sync to Studio One. 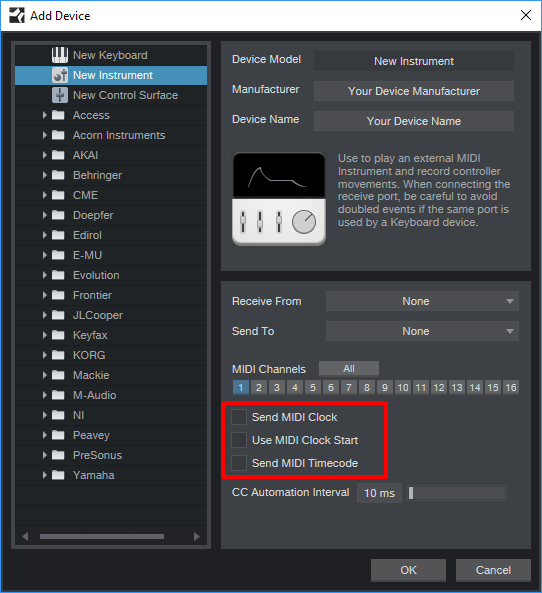 Enabling MIDI Clock Start will send MIDI Clock Start signals to your Instrument. Press OK. Your External Instrument is now available for use in any Song. To use an External Instrument in a Song, be sure that an Instrument Track is routed to it and that the appropriate Audio Tracks have been added and configured. 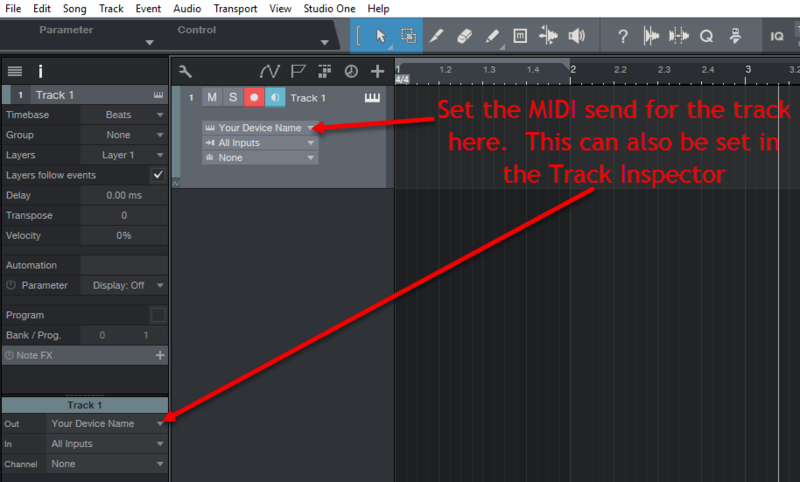 Below is a view of where the External Instrument MIDI send is set in your Song. In the Options/External Devices menu, click on the Add button. In the left-hand browser, choose your device from the predefined device list. Set this to New Keyboard if you do not see your device in the list. If set to New Keyboard, you may wish to type in a Manufacturer Name and a Device Name in the appropriate fields. This will make using your New Keyboard easier. Specify which MIDI channels will be used to communicate with this Keyboard. If you’re unsure of which MIDI channel to select, select all 16. The New Keyboard window also has MIDI filters which will filter out the MIDI information for the respective box. For example, if you check the box for "Aftertouch," all Aftertouch MIDI data will be filtered and will not be sent. Those options are there to filter out MIDI data that you do NOT want to be sent. If left unchecked, the MIDI data will be transmitted. Split Channels; place a checkmark beside this if you would like to create a separate Instrument Track input for each MIDI channel from the Keyboard. 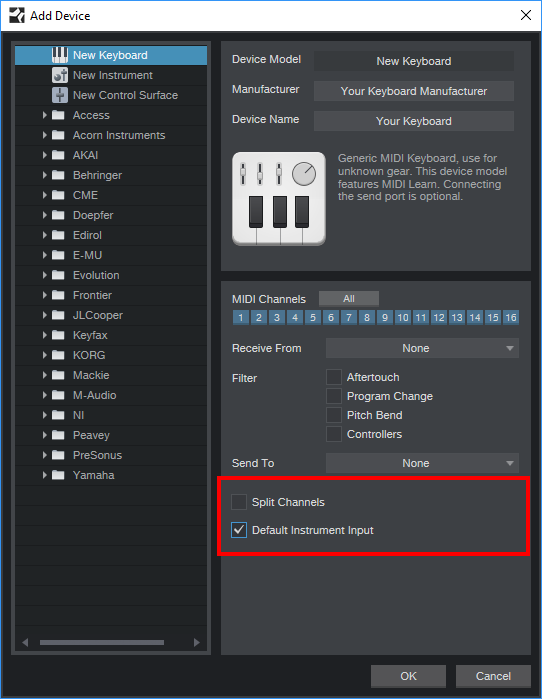 Default Instrument Input; Place a checkmark beside "Default Instrument Input" if you want this Keyboard to be the default MIDI input in Studio One. Press OK to commit the changes. Your New Keyboard is now available for use in any Song. 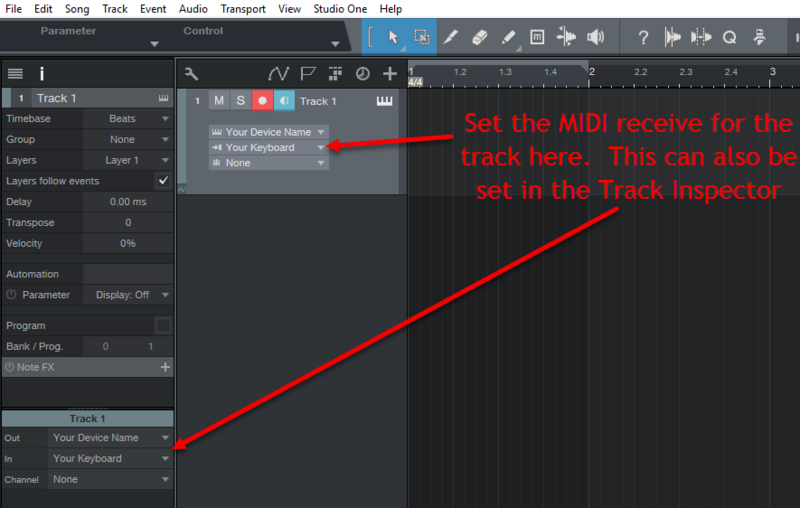 Below is a view of where the New Keyboard MIDI receive is set in your Song. 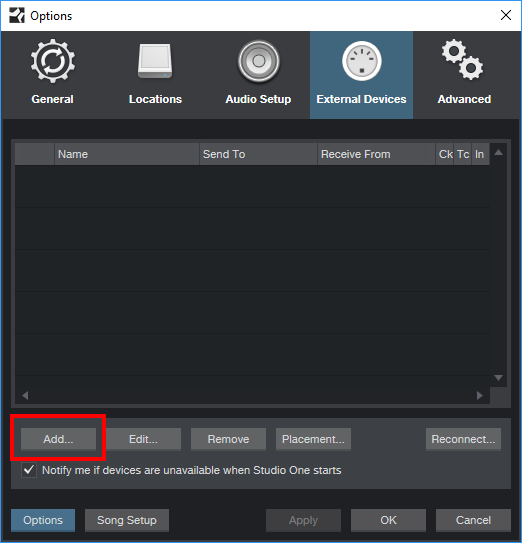 Also, make sure to the connect audio outs from your external MIDI devices to the audio inputs of your systems audio interface so Studio One can allow you to monitor these devices. Part I - Studio One 4 - How Do I Setup a MIDI Hardware Keyboard/Synthesizer in Studio One 4? Studio One 4 - Setting up a Song to Record With a MIDI Hardware Keyboard/Synthesizer in Studio One 4. Studio One 4 - Bounce MIDI to Audio From a Hardware Keyboard/Synthesizer in Studio One 4.